Walk straight out of Gable cottage to enjoy a drink on the patio. With its comfortable double bed and cosy sitting room, Gable is ideal for a couple. »	Living/dining area - TV, Freeview, radio, and books. »	Bedroom - comfortable pine double bed and built in cupboards. »	Patio area - table and chairs. 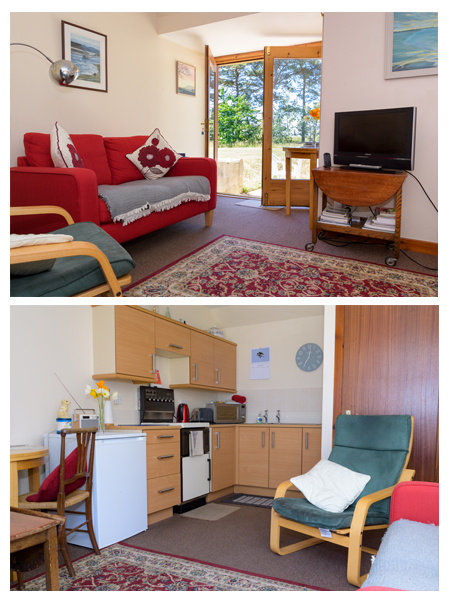 "A lovely cottage, comfortable, cosy and everything for ones needs. So pretty with all the flowers everywhere." "Perfect location, ideal for beach and forest walks, peaceful. What more can you ask for? We will be taking home one exhausted and contented dog." "Eighth visit to Gable. Ideal Autumn break, weather good, enjoying walking on the beach and sightseeing."